Although Asian Court is now our go-to dim sum joint, we had never been there for dinner. That changed on Sunday, when we enjoyed a bit of a feast from the "authentic cuisine" part of the menu. 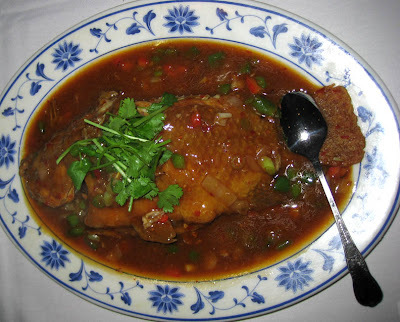 We tried the whole fish with soy bean paste, ordered "medium spicy." The fish turned out to be tilapia, which lent a bit too much of its metallic/raw sewage flavor to the dish. The sauce, which wasn't really spicy at all, was quite nice, and would work better with a fish with a more neutral taste. 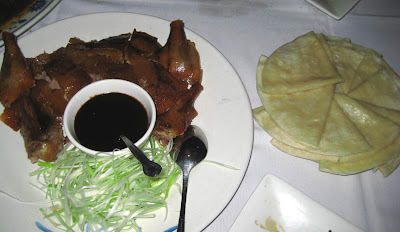 We also had the Peking duck done right, with tender meat sliced into slender ribbons and super crispy, fat-free skin (it was so crisp, it was actually sharp). Jesse Wong's Hong Kong had the best, but now that it's gone, Asian Court gets the title. 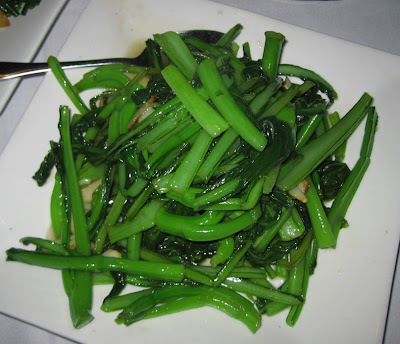 We usually get Chinese broccoli, but this time tried the Yu choi sauteed with garlic. Yu choi is a delicate-tasting member of the Brassica family, and this version was juicy and crisp. 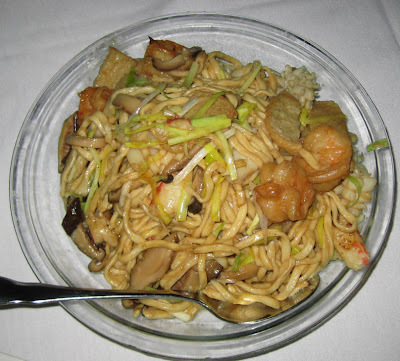 The chef's special "E-noodle" (yi mein) with seafood consisted of chewy wheat-flour noodles stir fried with shrimp, scallop, squid, and bits of crab stick. They had a nice mild flavor and provided a soft textural contrast to the other items we ordered. Finally, we ordered duck tongues with chive flowers. I had read about duck tongues recently and was very curious about them. Each tongue has a little bone inside of slightly fatty meat. Pop 'em in your mouth, work out the bone, spit it out (well, don't actually "spit" it out in a restaurant). Tasted like duck, but with a moister, chewier texture. 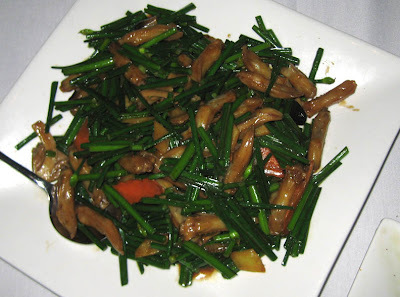 The chive "flowers" were actually chopped Chinese chives. They packed a nice green onion flavor, but were much milder than expected. We were quite happy with everything we ordered at Asian Court, so now we know that not only is the dim sum good, but also the dinner selections. 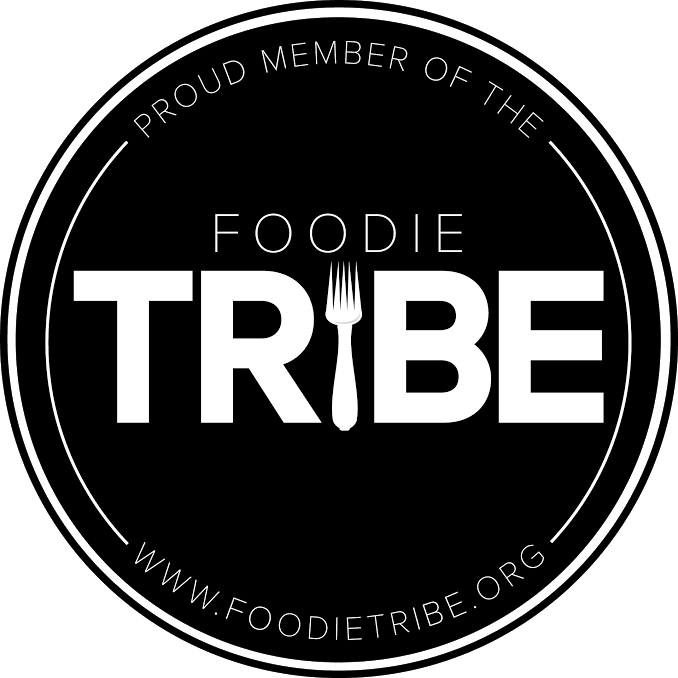 The staff is ridiculously friendly and accommodating, and the decor is pleasant. While it gets crowded for dim sum, the restaurant wasn't half-full at dinnertime, which is a shame. 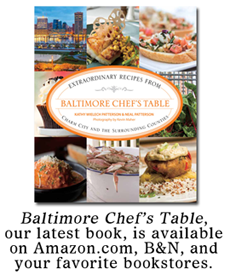 It's worth the trip to Ellicott City. Love Asian Court...recently had their clams with pork which was quite good. Tastes Different? or Different Tastes?